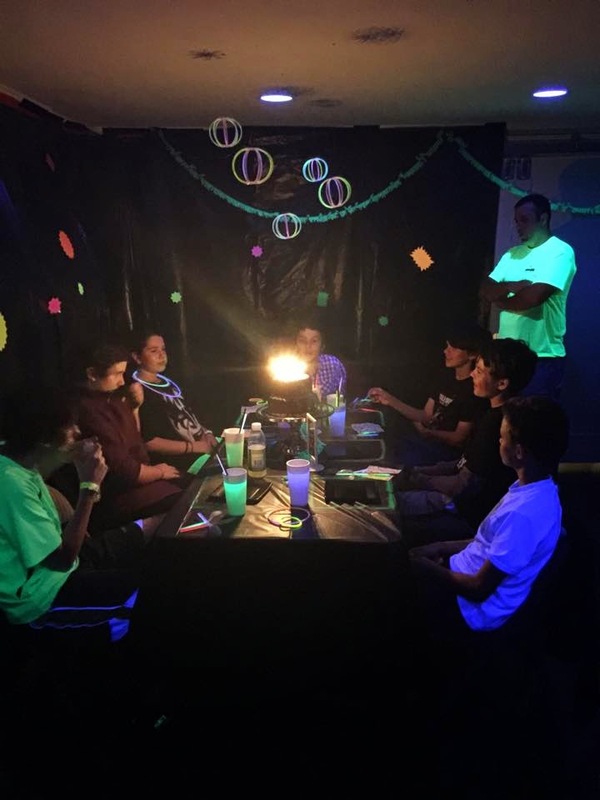 Last week my son turned 12 and we celebrated with his friends this weekend! 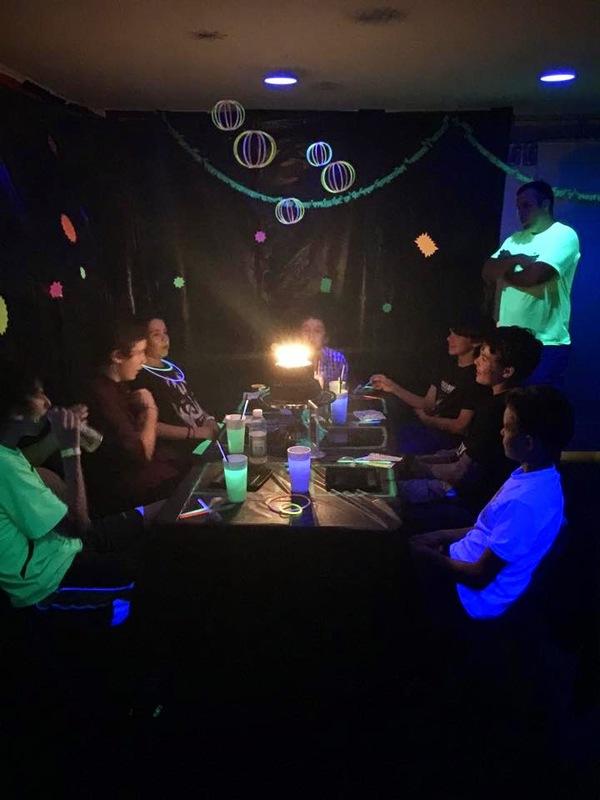 My son made it very clear that he wanted a simple sleepover party with the guys, and is past the stage of wanting themed parties like Army and Star Wars we’ve done in the past. 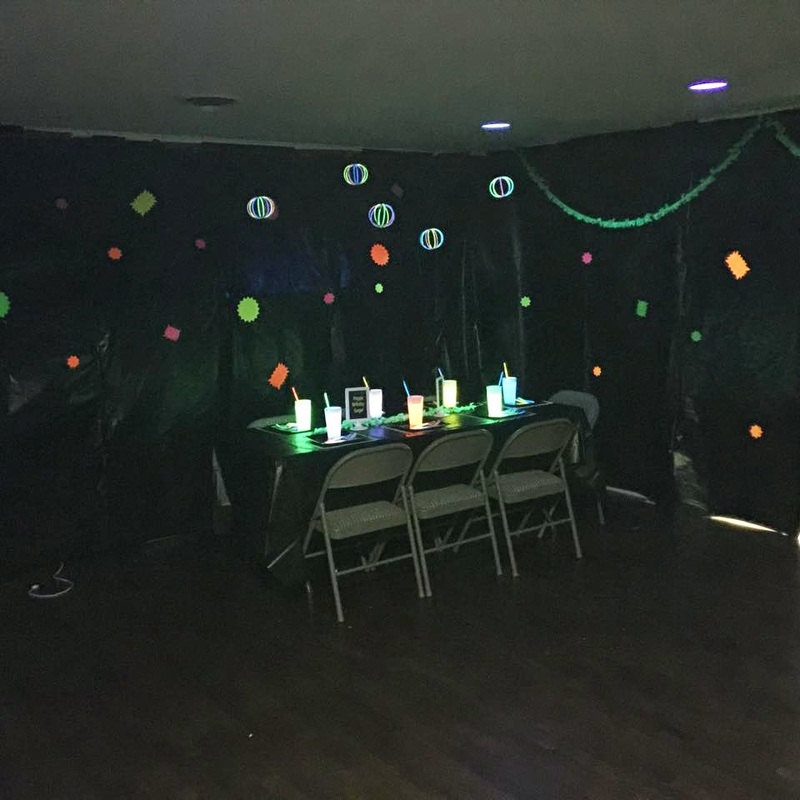 Well, I threw out the idea of having a “glow” party with some black lights, and he was all over it! 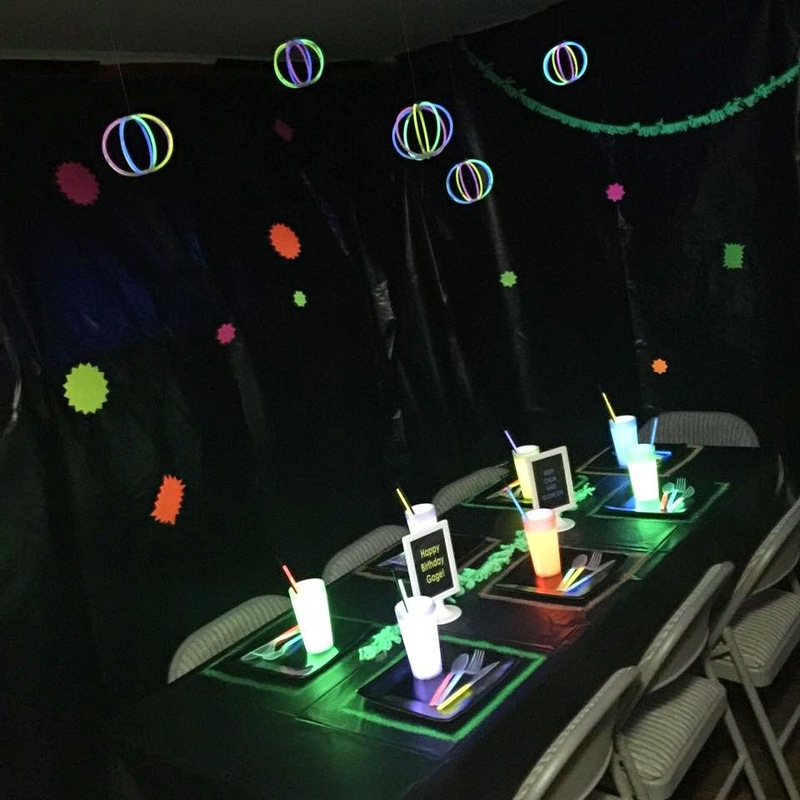 He became so excited and had all these ideas of what he wanted his party to look like. First we replaced all of our recessed light fixture bulbs with black light bulbs. 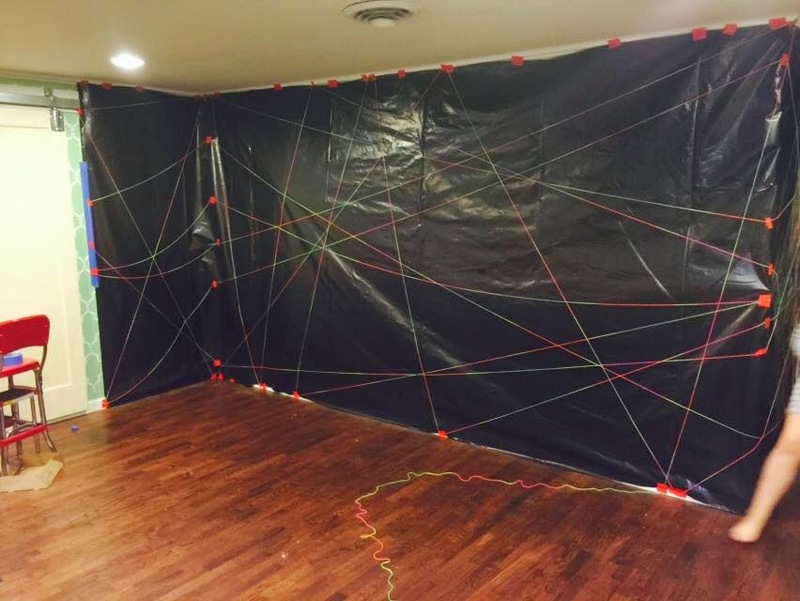 For a backdrop, we hung black plastic around our entire living room. 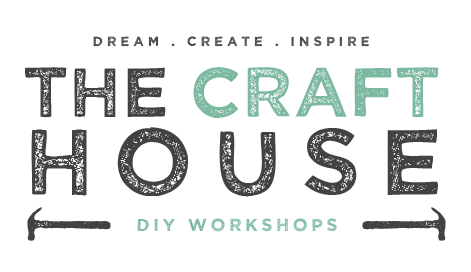 This is the same space that is used for Craft Club each month, so I prefer to call it my multi-purpose room. 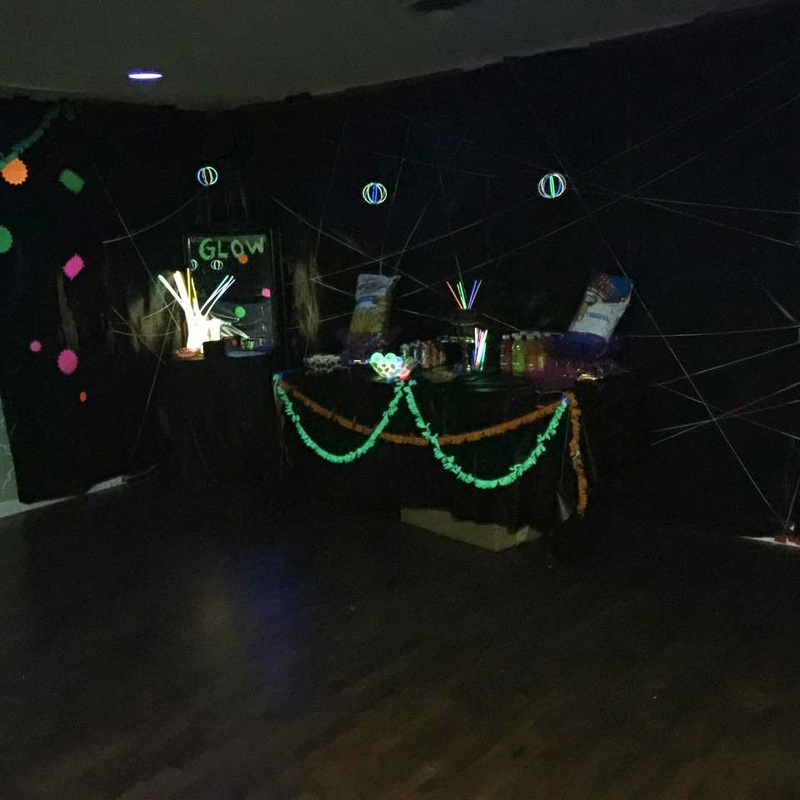 I bought some neon yarn that we hung on the main wall as a backdrop to the food table. 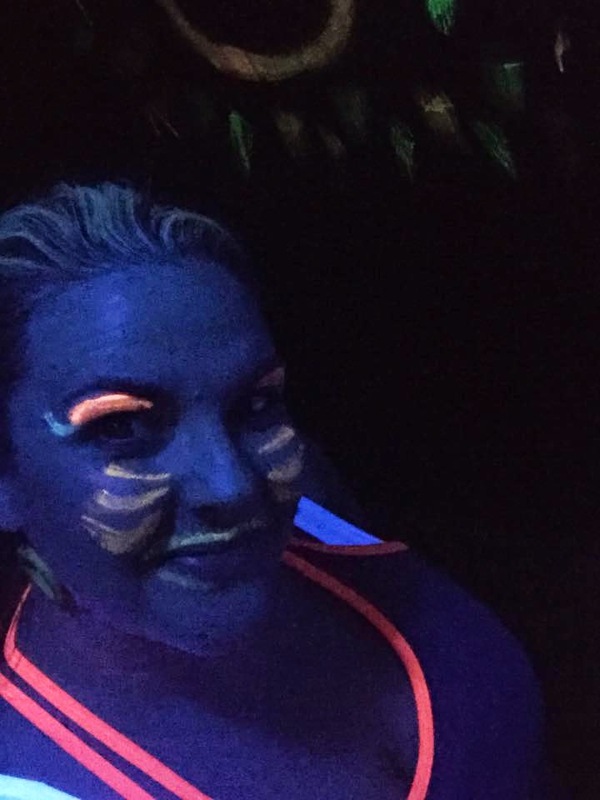 It was pretty neat once the black lights were on. 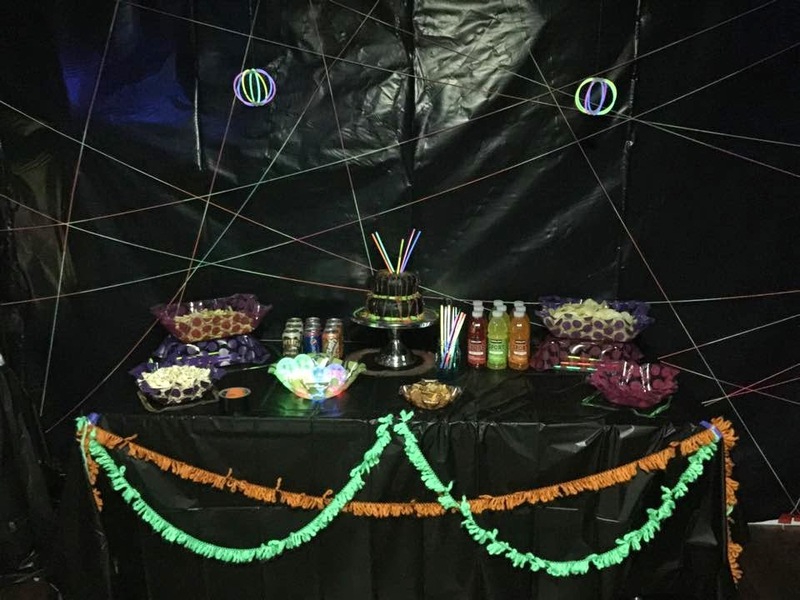 I covered the food table with a black tablecloth, and hung some neon fringe yarn across the front. The green worked really well, the orange didn’t show up so well. 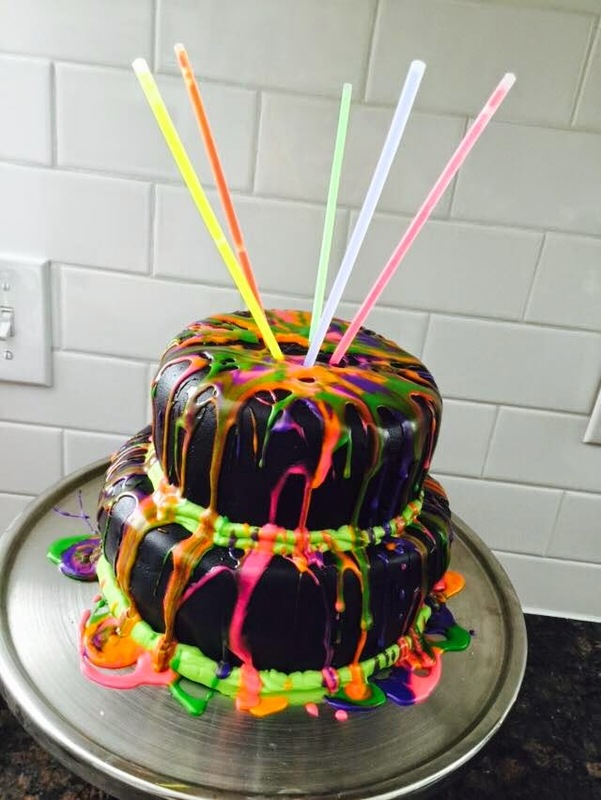 Moving onto the cake….. Let’s just say I wont be quitting my day job. I made this in just a couple hours and all from scratch, so I get points for effort right? 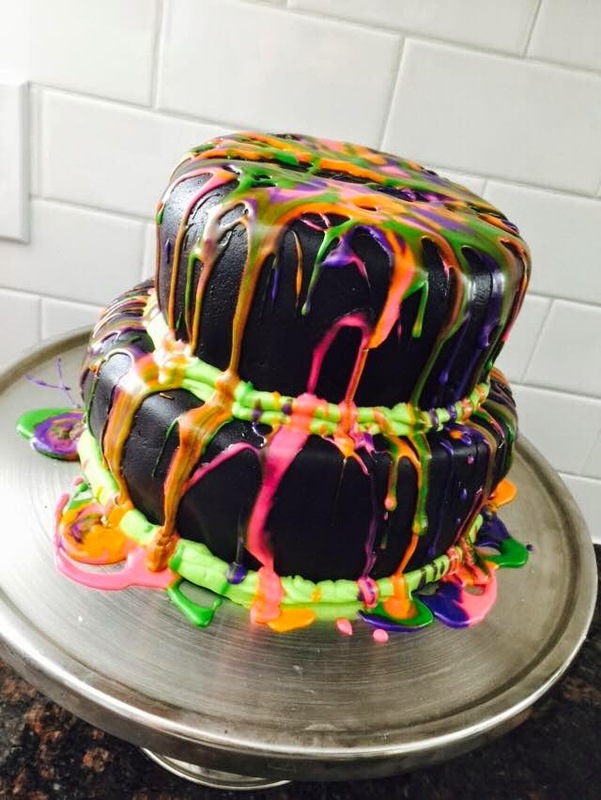 I made black marshmallow fondant and using a neon food coloring I made a thick royal icing and just drizzled it over the cake. 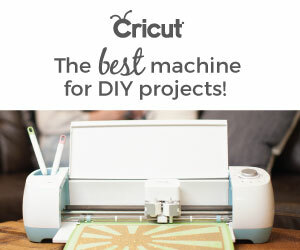 I’d skip the DIY and just order it here. 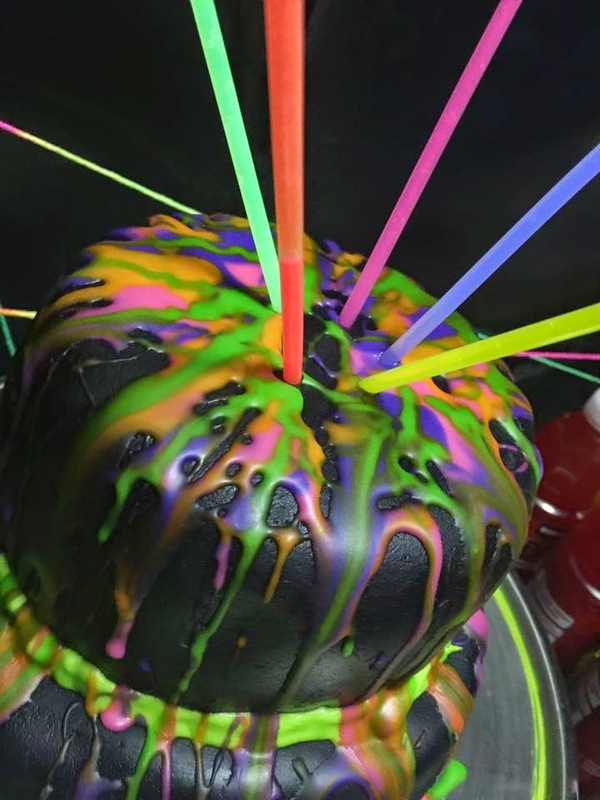 The neon frosting did not glow on it’s own, so I decided to add some glow sticks to the top to brighten it up, and it worked! The cake was delicious and the boys were pretty impressed with it anyways! 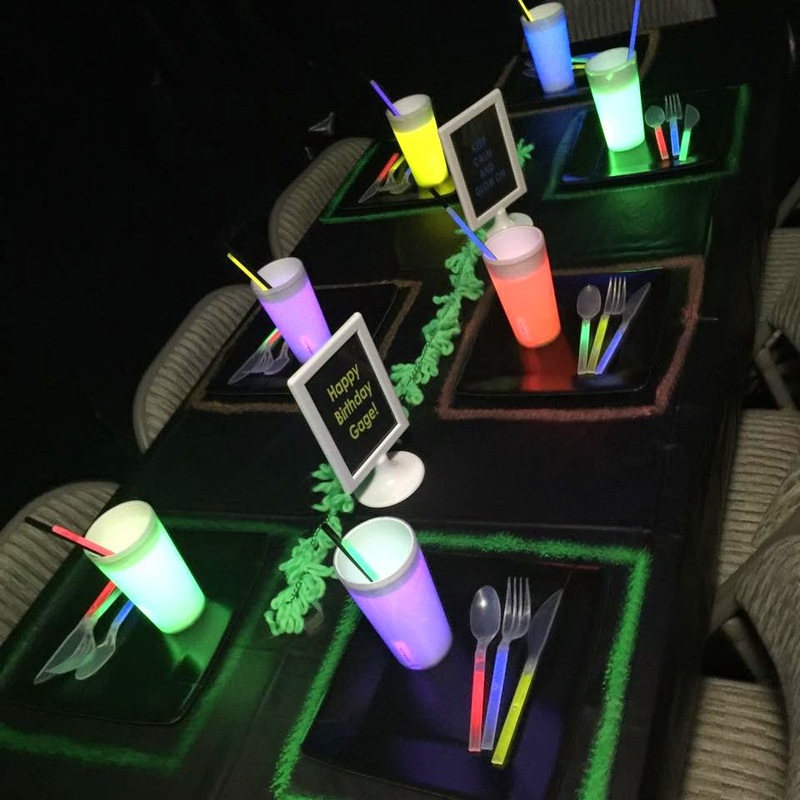 Quality pictures are hard to get in the black light , so I used a little backlight so you could get the idea. 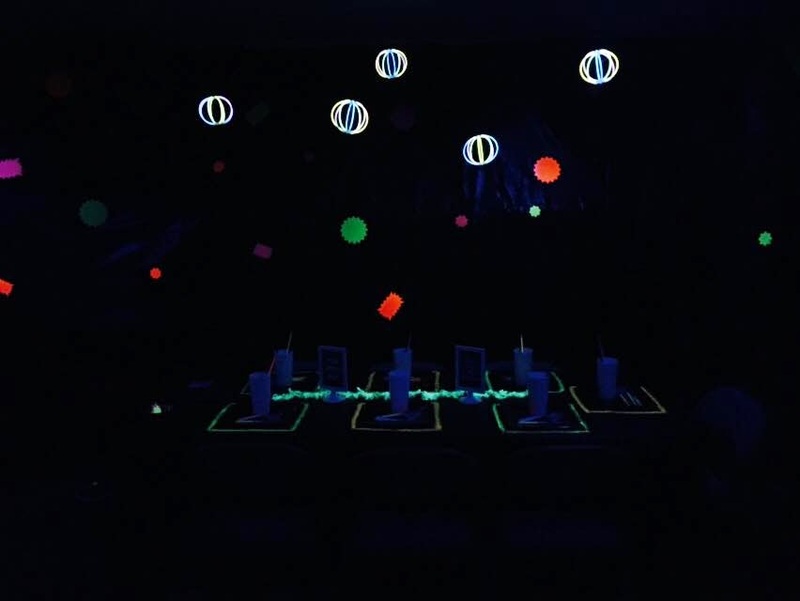 Here is the food table with some normal light. And here it is in the black light. 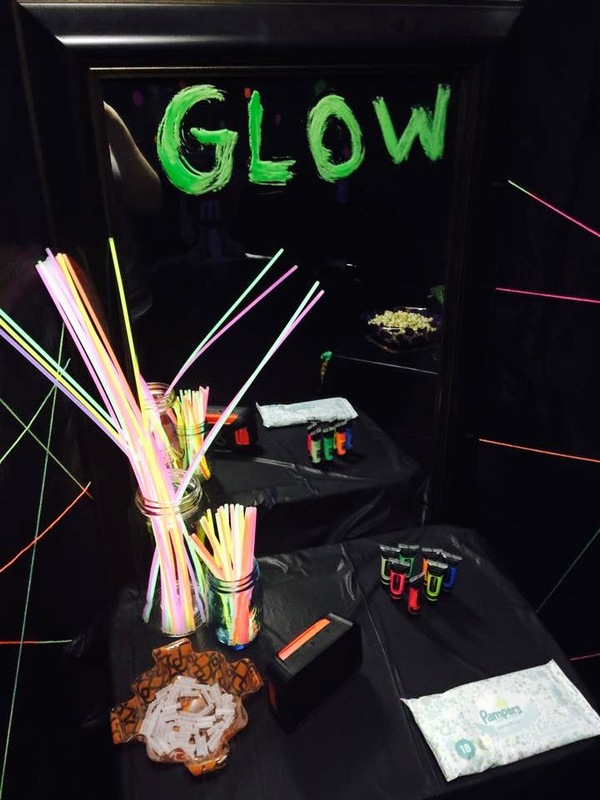 In one corner of the room I brought in a table and my floor length mirror and created a glow station that was equipped with glow sticks and face paints, along with q-tips and baby wipes. Here is a photo of the station with normal lighting. The face paints worked so well! 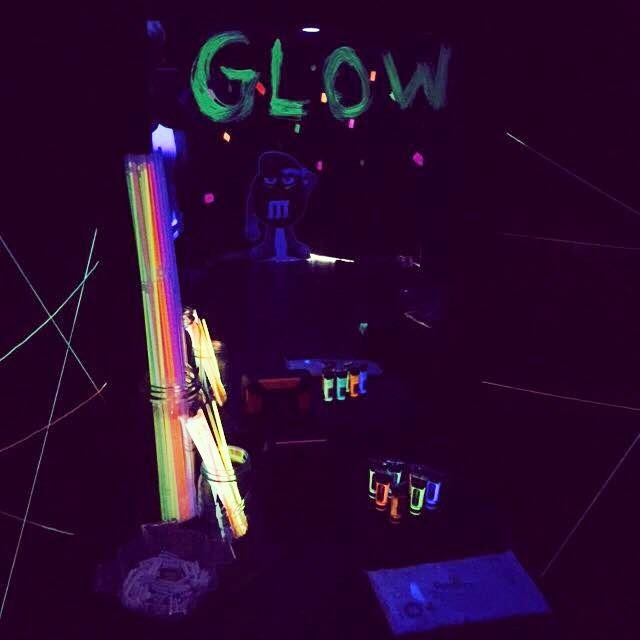 This is the glow station in the black light. And of course, what 12 year old boy doesn’t want to party with his mom?? 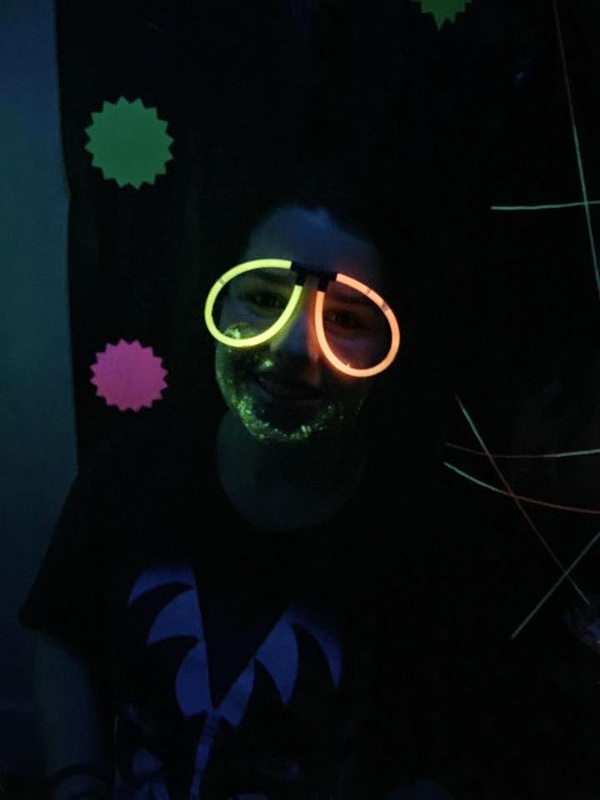 I will admit, it was pretty fun painting my face and getting decked out in glow clothes. Moving onto the main table. This was the best part in my opinion. 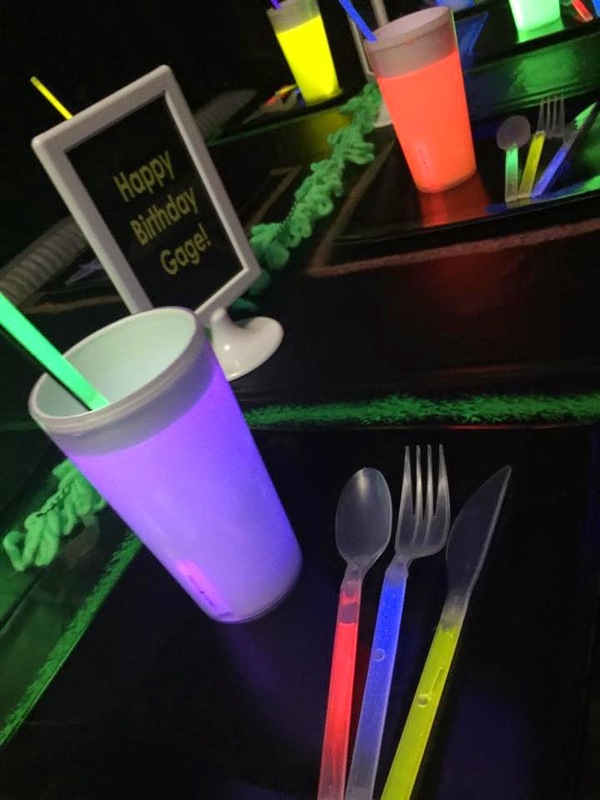 This photo was taken in the black light, before we activated the cups and utensils. Keep in mind too, this is at 3pm so its very bright outside. 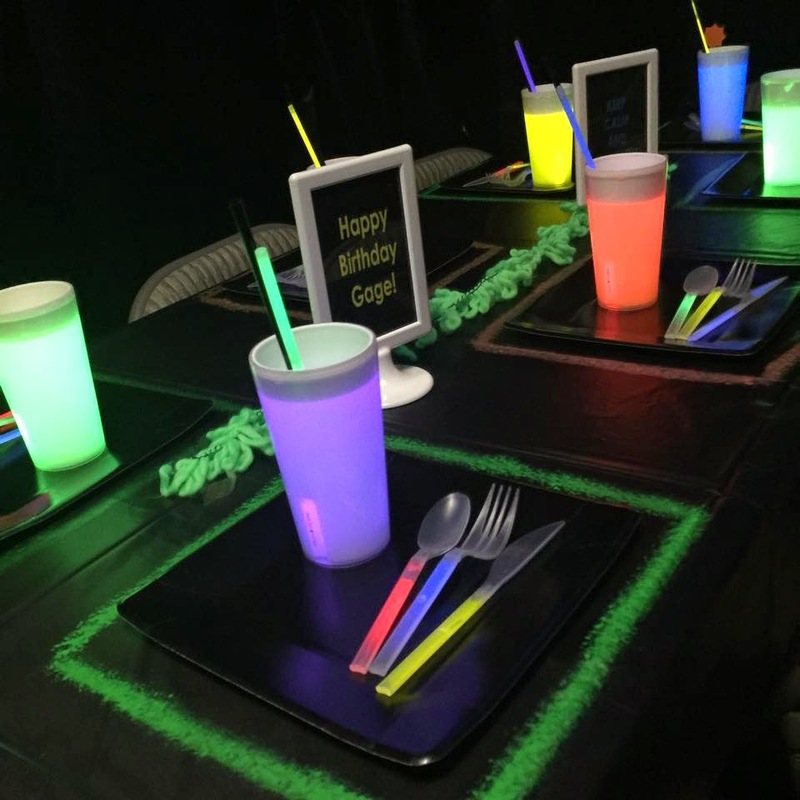 We ordered glow cups, straws and utensils from Windy City Novelties. You can also find them on Amazon. When we started cracking all of those, things got real! 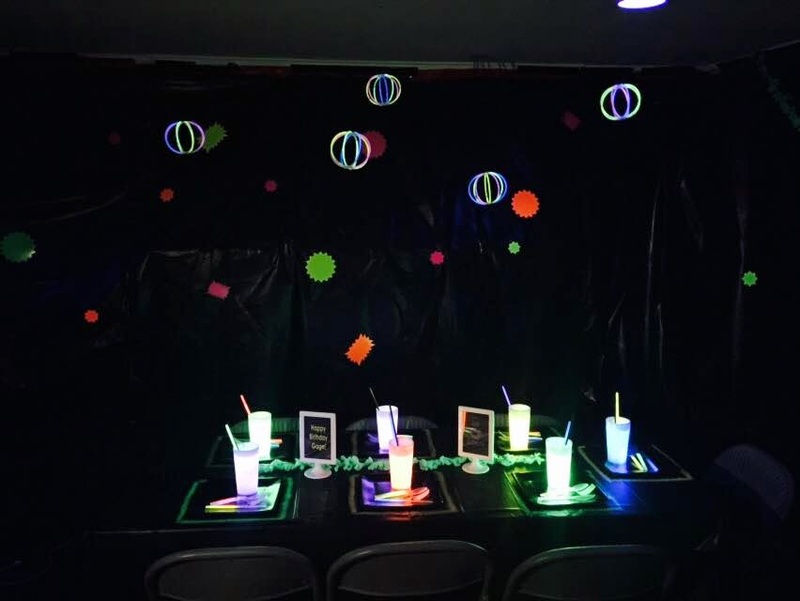 I used black square plates from the Dollar Tree and painted an outline around them on the black tablecloth using some neon acrylic craft paint. I placed a leftover piece of the green yard along the middle, and used ikea frames with some personalized messages for some décor. 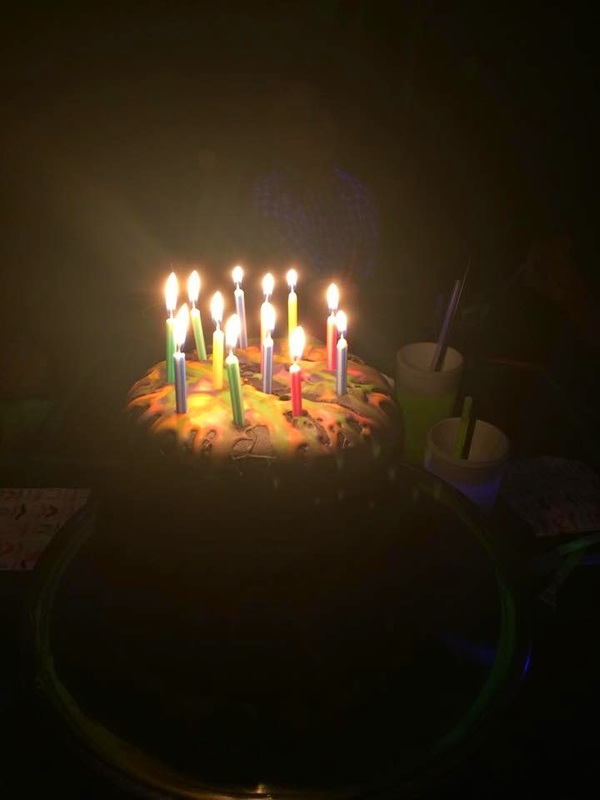 This picture is with normal lighting. 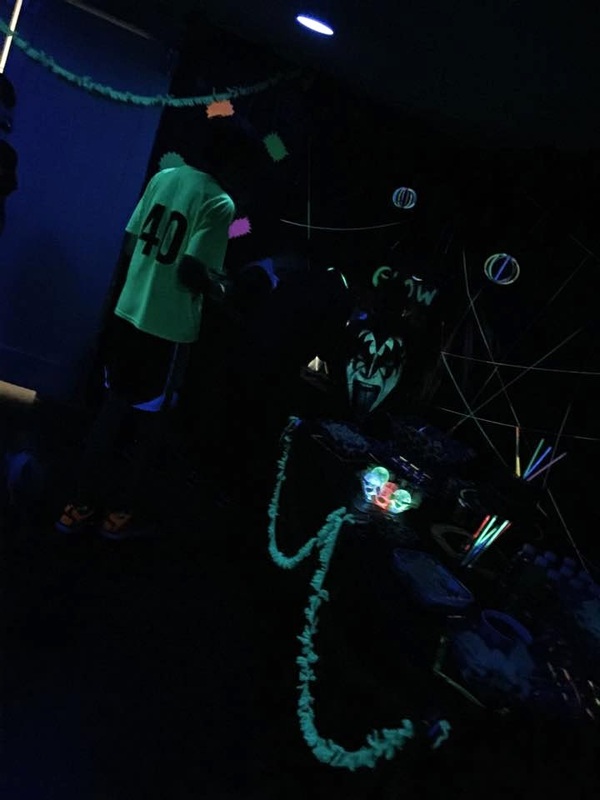 Here is a shot in the black light. I absolutely love how this turned out! 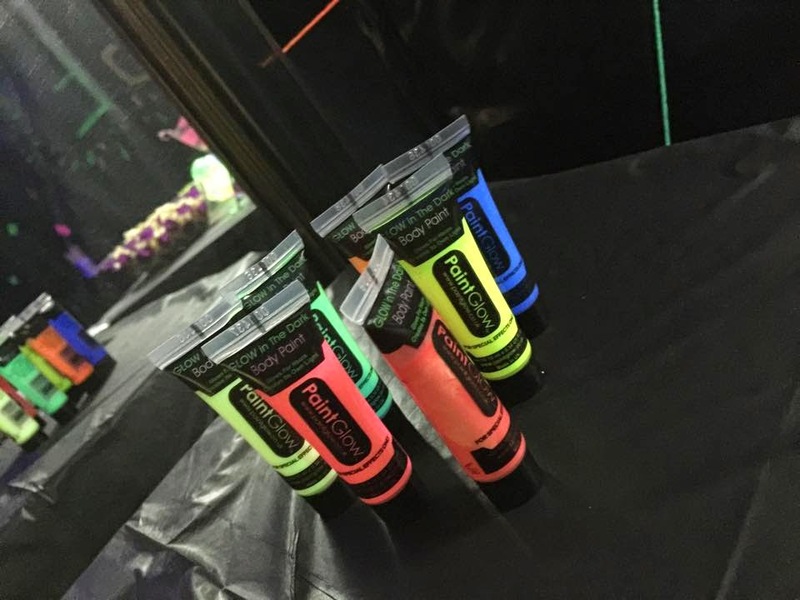 The shapes all over the plastic were found at the Dollar Tree in the school supply aisle near the garage sale signs. It was total luck that I walked by those, and really hoped they would work in the room. 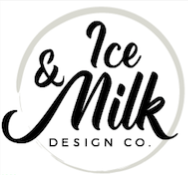 Of course, they were amazing! 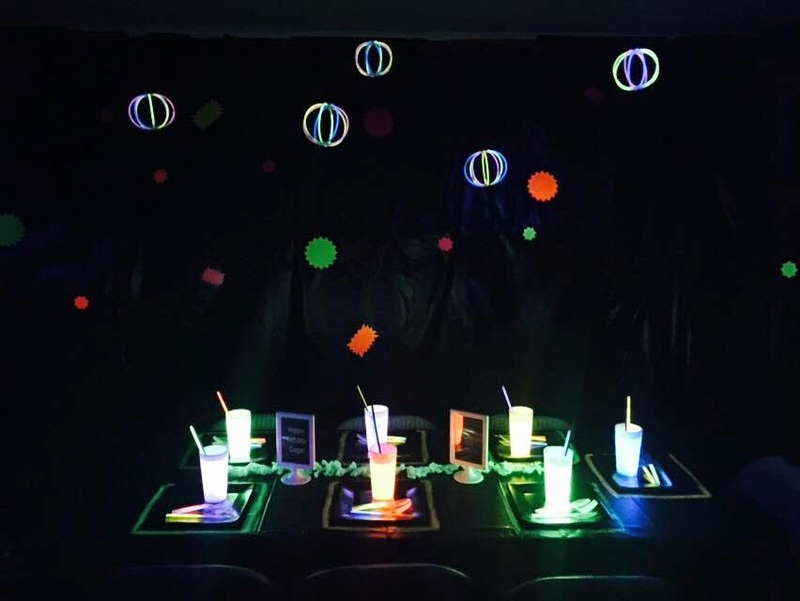 These fun globes came from the Dollar Tree as well, and made the perfect orbs to hang above the tables. 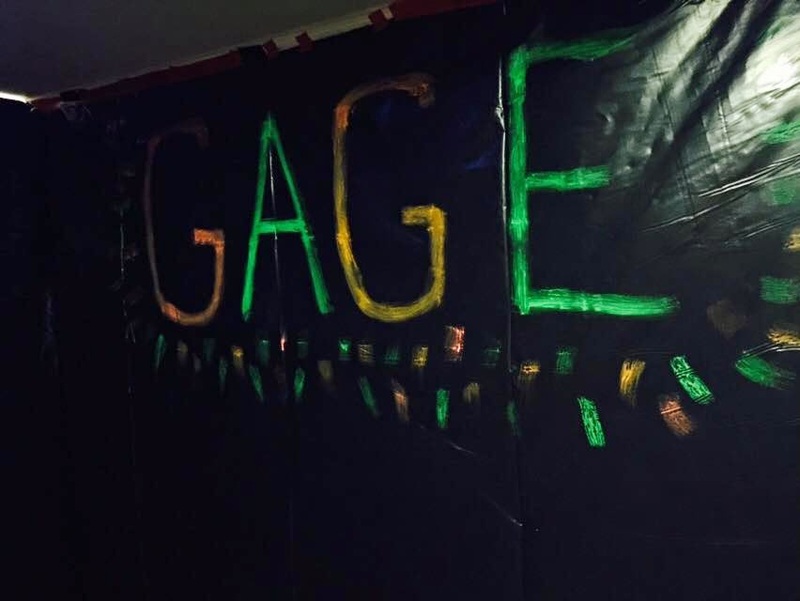 On one of the walls, I used the neon acrylic craft paint and wrote his name, and all of the boys loved that add to the party display. I am going to leave you with a few fun pictures of the boys enjoying the fun! 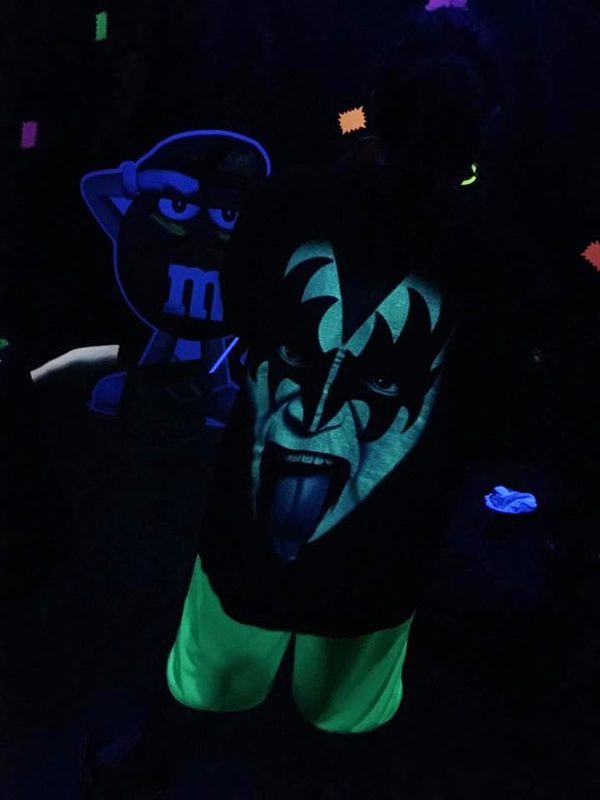 One of them even came dressed in the perfect Neon KISS shirt! Thank you to my readers for stopping by today. 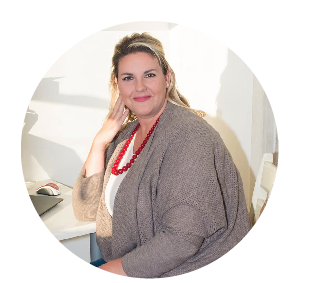 Don’t forget to follow me on Facebook and Pinterest, and you can find me on Instagram and Periscope @OneThriftyChick. 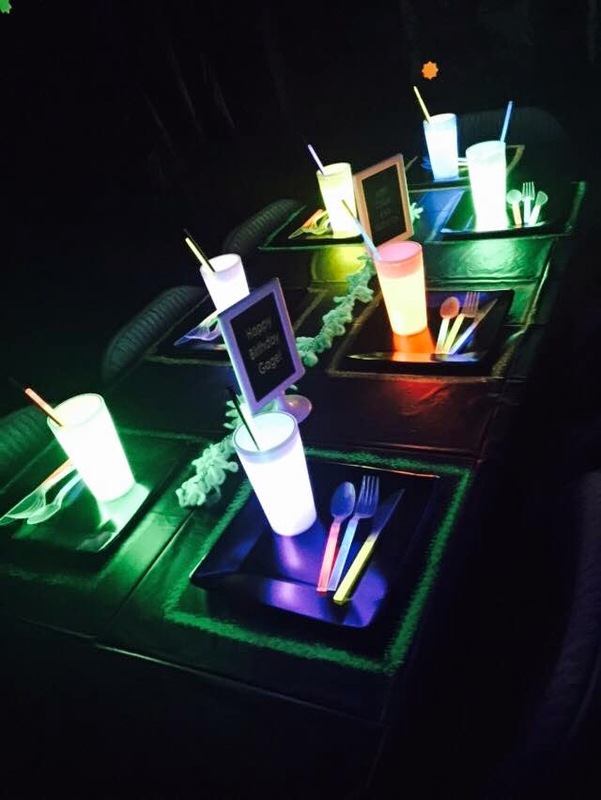 What a fab party! Brilliant idea for a difficult age, I have 2 teenage boys and I'm pretty sure they would have loved this. Maybe next year! 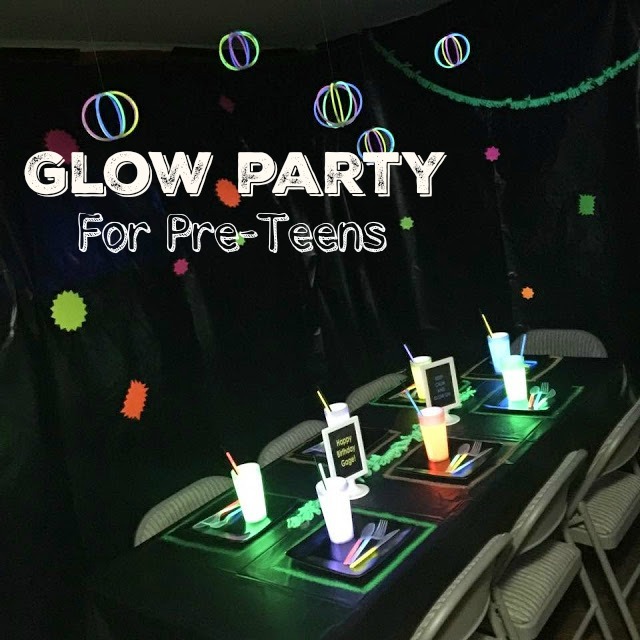 This looks like a great party! 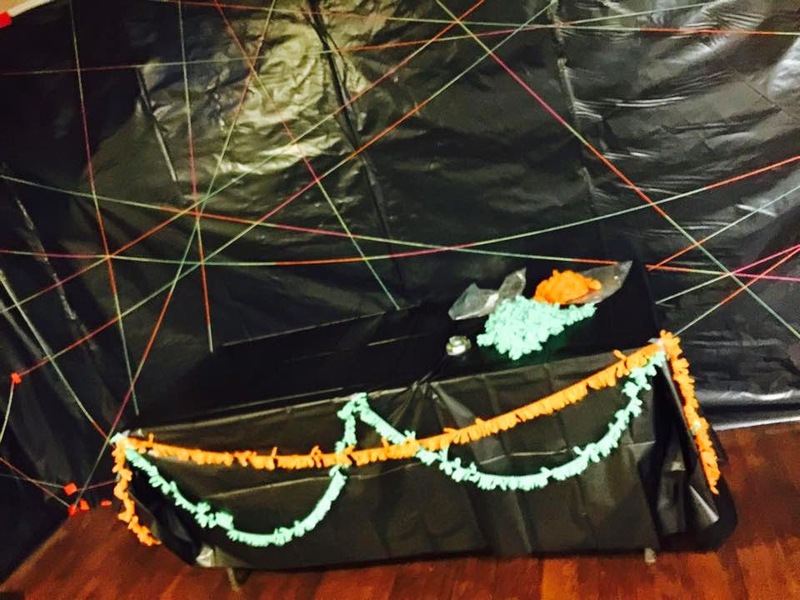 We found the most important tip was to hang the black bags/tarp on the walls. 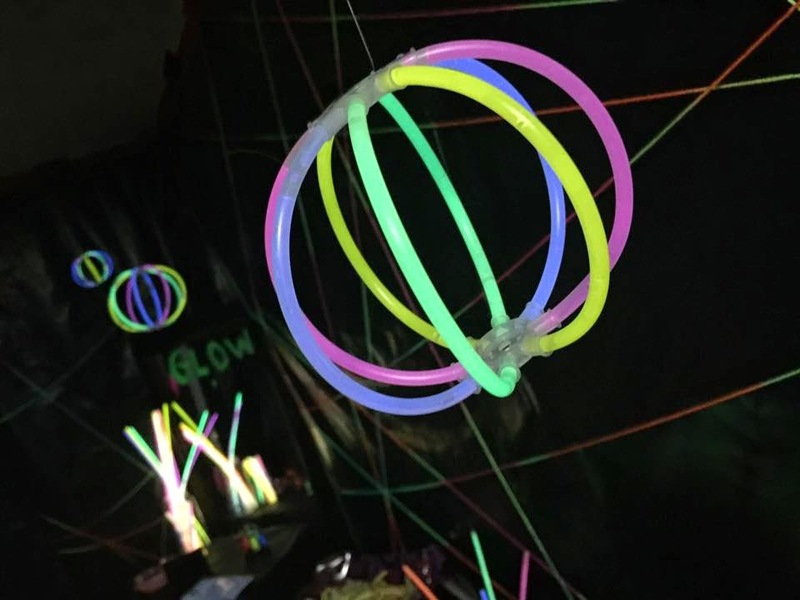 We did a glow party and I posted free invites on my site.